China has accused the Indonesian navy of opening fire on a Chinese fishing boat in disputed fishing grounds. China's foreign ministry said on Sunday that one fisherman was injured and several detained. The incident happened on Friday near the Natuna islands, off the coast of Borneo in the South China Sea. Indonesian Vice-President Jusuf Kalla said on Monday that China would be asked to respect his country's sovereignty around the islands. "This is not a clash, but we are protecting the area," Mr Kalla told Reuters news agency. Indonesian Fisheries Minister Susi Pudjiastuti tweeted that the navy "made the right move by maintaining the sovereignty of our seas". "Stealing fish is a crime," she said. A spokeswoman for the Chinese foreign ministry described Indonesia's actions as an "indiscriminate use of force", adding: "We urge the Indonesian side to refrain from any action that complicates or magnifies the dispute, or impacts the peace and stability of the region." The ministry said the incident had happened in a "traditional Chinese fishing ground". 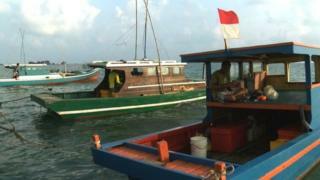 It is unclear whether the fishermen are still being detained by Indonesian authorities. Friday's incident was the third altercation between Indonesia and China in waters near Natuna this year. In March, Indonesia lodged an official protest after an Indonesian patrol ship tried to detain a Chinese fishing boat in the Natuna Sea, but was prevented from doing so by the Chinese coastguard. Video South China Sea: Does a book prove China's claim?